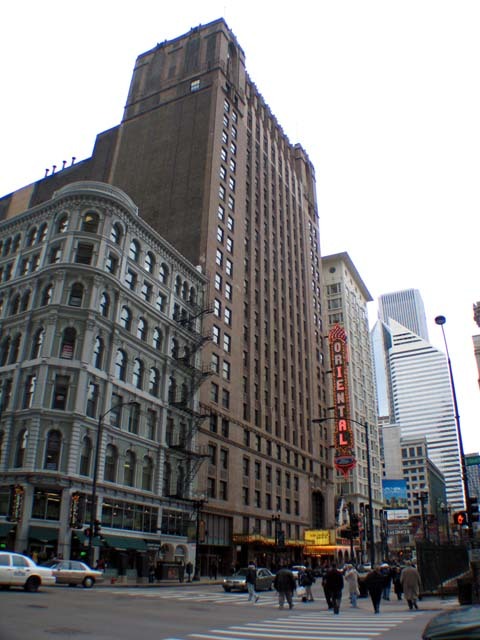 The Oriental, located in the United Masonic Temple building at 24 West Randolph Street, opened in 1926 as part of the Balaban & Katz circuit. The Colonial Theatre, formerly the Iroquois, was demolished to make way for the new development; it was at the Iroquois in December, 1903 where 600 patrons leapt or were trampled to death following a fire on the stage. The Oriental is the only theatre designed by George & C.W. Rapp in this Far Eastern style; it is rumored that the Rapp brothers were displeased with B&K's insistence on the design and deliberately styled it to excess. The theatre closed its doors in December, 1980 due to gang activity and was home to an electronics store for more than a decade. Extensive renovations that enlarged the lobby and stagehouse and reduced seating by 1,000 began in 1996; the Oriental reopened in 1998 as the Ford Center for the Performing Arts.